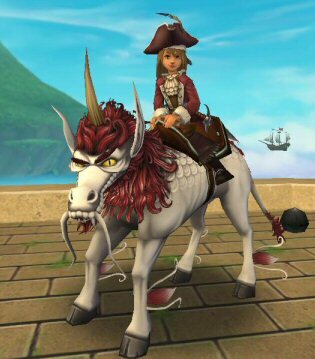 Mounts available in the crown shop!Victoria has acquired her first Pirate101mount. The Kirin that she has lovingly named Artemis. Yeah, like the Musketeer. What I like bet about the mounts, you can paint them whatever color you want from the very beginning. So Artemis wears the same colors as Victoria’s ship. There are some familiar mounts in Pirate101, such as the flying turtle, manta ray, prancing pony and the familiar wings. But there are some new mounts as well. The Kirin caught my attention because he’s so unique!